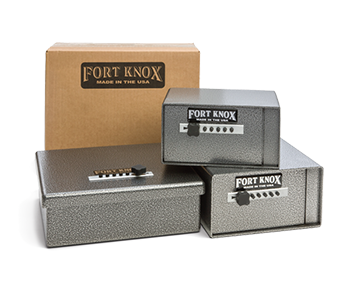 Fort Knox is proud to offer a superior product in terms of quality, craftsmanship, and protection. We are so confident of this fact, that we are the only manufacturer to offer a true comprehensive lifetime warranty. This includes the lock, interior, paint, handle/bolt work, mechanism, clutch and body of the vault. Our warranty comes first; without waiting for an insurance company’s lengthy claim process - because your valuables can not afford to wait. Fort Knox has folded the edge around the door, making it virtually impossible to pry. Securing the corners of the door to prevent attacks on Guardian, Titan, and Legend vaults. 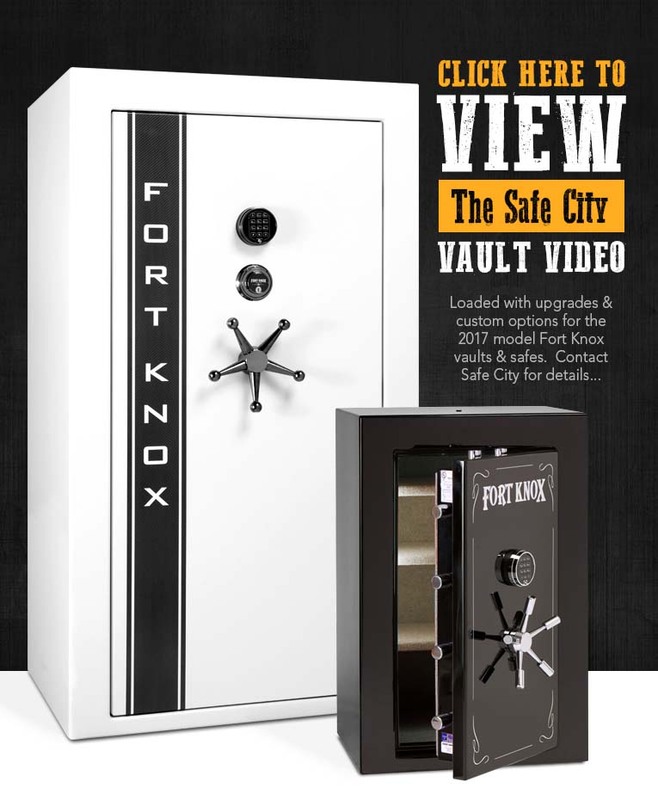 Fort Knox Vaults will protect your possessions with a Reinforced Fire Liner option. All Fort Knox Defender Vaults & above come standard with an internal power supply. The Quadrafold Door Frame has been designed to be the strongest in the industry. Bearings are recessed into the hard plate and will cause drill bits to slip and break. 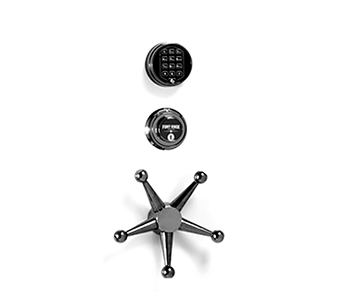 Our UL Listed Group II mechanical lock resists manipulation & “safe cracking” attempts. Our patented rack & pinion bank locking drive is the most reliable locking system available. Fort Knox exceeds the industry standard for vaults. 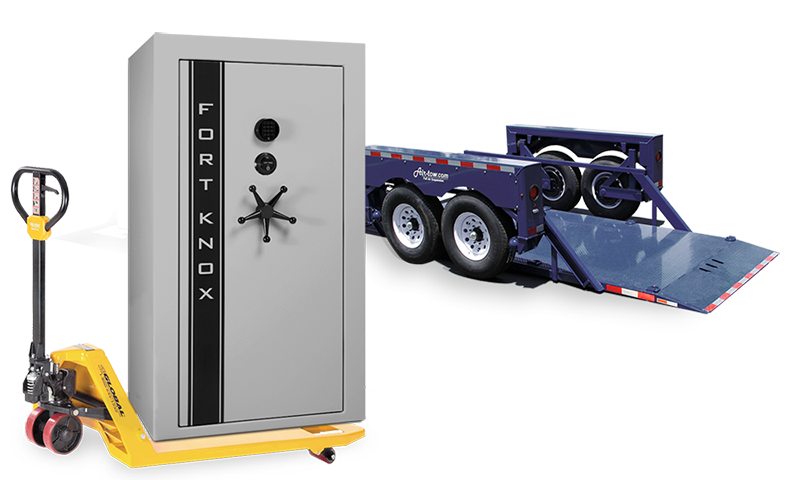 Take a look at just some of the standard features that make Fort Knox more than just a safe. The innovation in our Reinforced Fire Door comes from the combination of 21st century technology and time-honored thick plate steel. 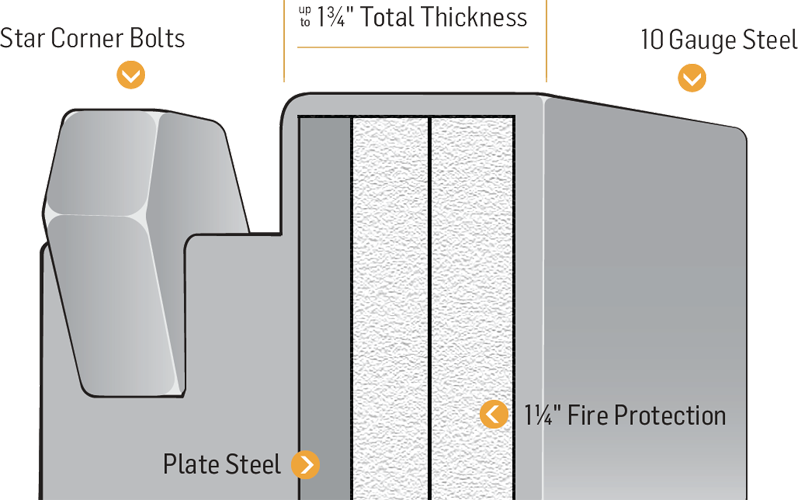 The outer edge of the door is precisely folded around two layers of fire board (one layer in Maverick safes) and a solid steel plate that runs the full length and width of the door. Because there are three layers of steel on the outside edge of the door, (where a prying attack would take place) Fort Knox Vaults are unmatched in strength and security. Safes are heavy and require expert rigging when moving to prevent injury and damage, many of the repairs we do are the result of improper safe moving. Over 99% of your standard moving companies are not equipped to move your safe in the proper manner, resulting in damage to your safe and home, even injuries & death to inexperienced movers. Safe City is Licensed & Insured to move any size safe, we are one of the largest safe moving companies in the the United States and have moved thousands of safes. We have the know-how and equipment to move your safe successfully. Prompt service to most locations in the US. Please contact us for a free estimate. Safe City also provides full service repairs and support for any safe issues or damage, give us a call for a free estimate. 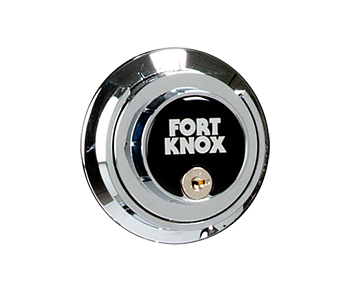 Fort Knox locking systems are the best in the industry. We offer many options when customizing your safe such as redundant locking, SG mechanical, digital and relocking protection. If a thief attempts to cut out the lock, the relockers drop into position and keep the door closed. 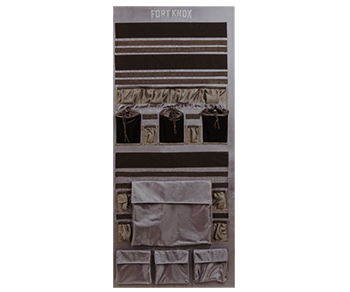 Fort Knox provides you with not just one, but three or more relockers to keep your door tightly closed against the most determined attacker. 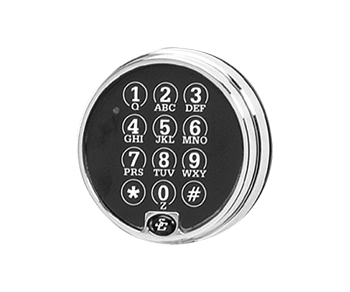 Never worry about being able to get into your safe in the event of an electronic keypad failure. The Fort Knox Redundant lock opens with both an electronic combination and a mechanical dial, but with only a single lock. Have complete peace of mind knowing that whether you need quick access or long term reliability; the Redundant lock offers both. Only at Fort Knox. 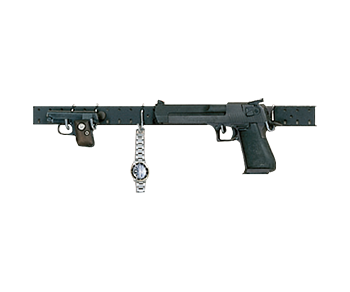 This Group 1 Manipulation Proof combination lock exceeds 20 man hours of manipulation resistance. Designed and constructed to perform in the most demanding commercial applications, the MP lock will give you ultimate security in your home or office. Chrome only. The redesigned locking mechanism controls the retraction and extension of the boltworks through a motorized blocking device. The PivotBolt relieves handle side pressure and automatically locks to resecure the safe when the boltworks are in the closed position. The new turret system that can be installed into your vault will help maximize the amount of space you can use inside your vault. Attaching to the door, the turret hold 8-12 guns securely upright and swings with the door, allowing for easy gun access while open, and maximum space efficiency when closed. 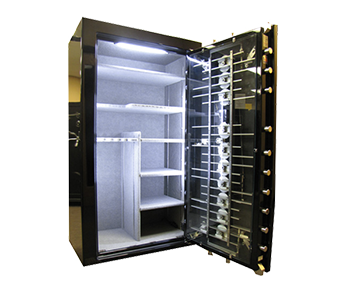 Customization of your vault from our wide range of options will reflect how often you are in and out of the vault. Great options with vaults are lights, dehumidifiers, and electronic locks. Custom colors, decals and interiors are all available with a Fort Knox Vault. For whatever you need to protect, Fort Knox will custom build a vault that is specifically tailored to your needs. Every home is different, as are the needs of each individual who requires various levels of security. 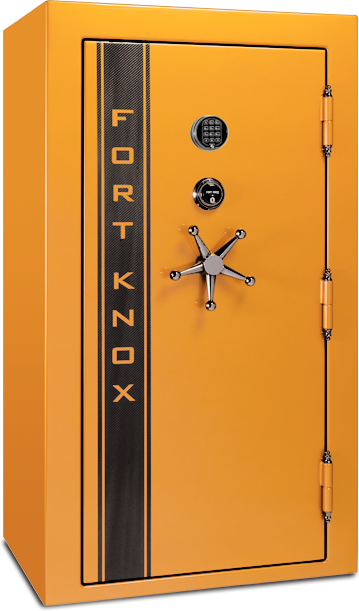 Whether your vault needs to hold 5 guns or 50, be bright orange, or have accessories to fit your posessions, Fort Knox will make sure it fits your personal needs. Light up the interior of your vault with fluorescent lights that surround the door frame. When the door is opened, these lights will make your valuables shine. 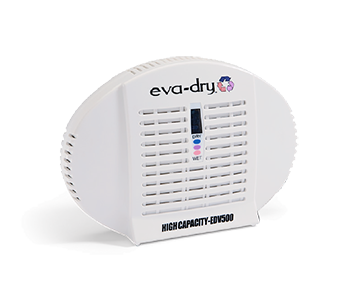 Dry unit contains Water Glass Technology crystals. Water Glass is a very thirsty substance that has an absorption rate much higher than traditional, soluble humidity adsorbing products. 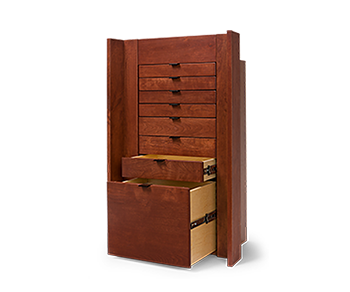 Add an exquisite drawer system to your vault and discover the ease of finding all of your items right where they belong. All eight drawers, including one file drawer, have exquisite construction and a deep wood finish with easy grasp drawer pulls that put the finishing touches on any vault. Add a secondary locking box inside your vault for those other items you don’t want anyone to see. They come in three sizes for your convenience and all come with a mechanical lock and a Lifetime Warranty. Have access only when you want! Protect your valuables in your car or in your home. Choose from one of these two sizes for maximum storage. 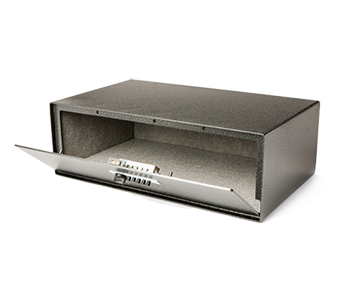 These new high security Pistol Boxes are constructed with a heavy 10-gauge body and a 3/16" plate door. The 6" deep version is great for an automobile, the 12" can be used in many applications. This high quality decorative shelf makes an excellent addition in any home and serves as an excellent showcase for your prized possessions. Vaults are the best security for your firearms but quick access can be elegant. Access is controlled through a special magnetic key. 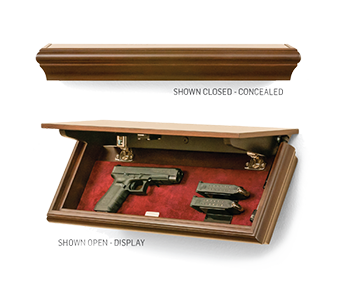 Keep your handguns and other valuables accessible, and your vault organized with our door mounted rack and covered hook system. Organize your handguns with ease. 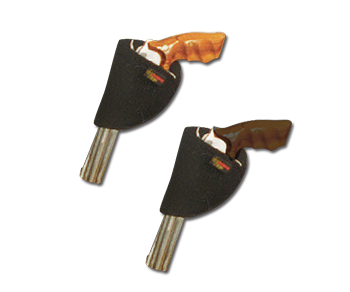 Hook and loop material allows easy positioning and repositioning instantly. Strong enough to securely hold the largest hand guns. One size fits most. The Door Organizer gives you a variety of options for added storage. Cargo net pockets, zippered pockets and pistol holsters are all included for additional convenience and organization. 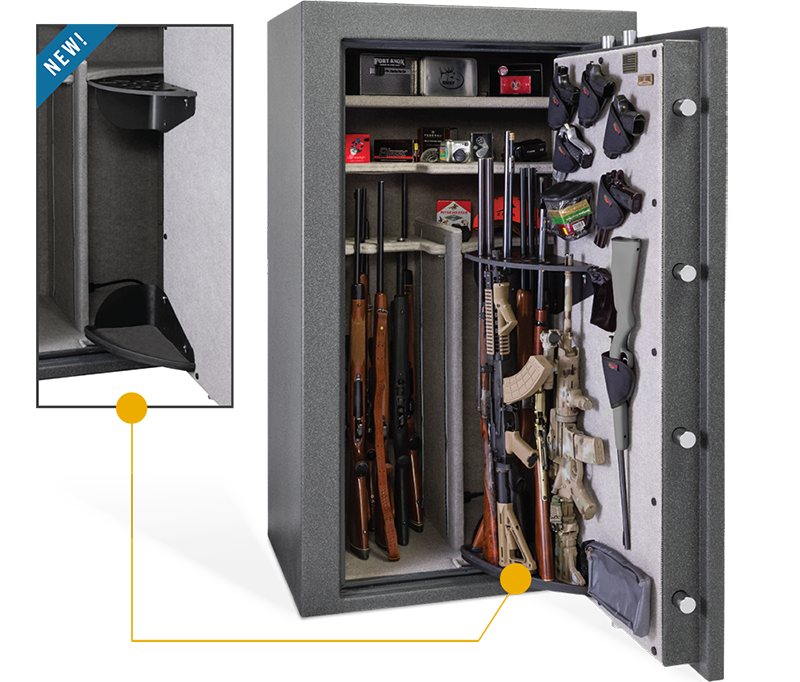 Take advantage of all the usable space in your vault and add the Tactical Door Organizer to your options list. Contact us today for more information and pricing on purchasing a new safe or replacing an unprotected safe. We welcome all visitors to our showroom in Mesa Arizona! © 2017 All Rights Reserved, Safe City LLC.